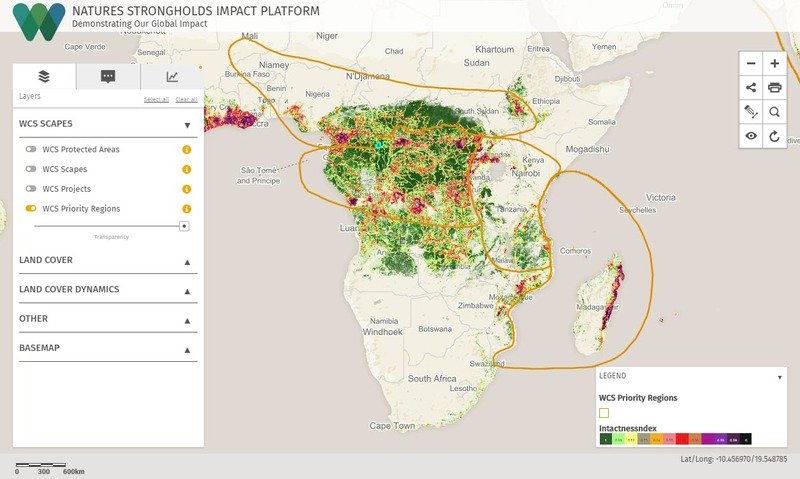 At the Wildlife Conservation Society (WCS), staff are using the Global Forest Watch MapBuilder platform to show their global impact. WCS works to conserve the world’s largest wild places in 16 priority regions. Their new MapBuilder platform is a powerful mapping tool for analyzing data in priority conservation areas. WCS’ platform combines the use of remote sensing and GIS to visualize and monitor top priority regions for conservation. Through a combination of interactive mapping, data visualizations, and analytical reports, the platform provides staff with access to information on the current state of WCS protected areas around the world. The platform incorporates a breadth of data on priority landscapes and sea- and coastal- scapes (known as “scapes”). In addition, it visualizes key project areas where WCS is working to have a conservation impact on species. By centralizing this data all on one platform, users can visualize overlap and patterns. For example, staff can overlay forest fragmentation, infrastructure development, and conservation areas to quickly see if wildlife movement is blocked between and within protected areas. This is especially important in Africa, where species like elephants, giraffes, and zebras travel long distances between wet and dry seasons to survive. Which protected areas have experienced the greatest forest disturbance in recent years? How have species population trends changed over time? Where are the last unbroken swaths of intact forest? WCS can also visualize their impact. For example, thanks to conservation efforts, Nouabalé Ndoki National Park is free from logging and contains no roads within its borders. The park covers more than 4,000 square kilometers of contiguous rainforest and is a stronghold for iconic species including forest elephants, western lowland gorillas, and chimpanzees. Check out the WCS MapBuilder platform today!